If you're a student, or a budding band or artist or looking for a microphone set but don't have the largest budget then the Complete Microphone & Stand Kit is the ideal solution for you. 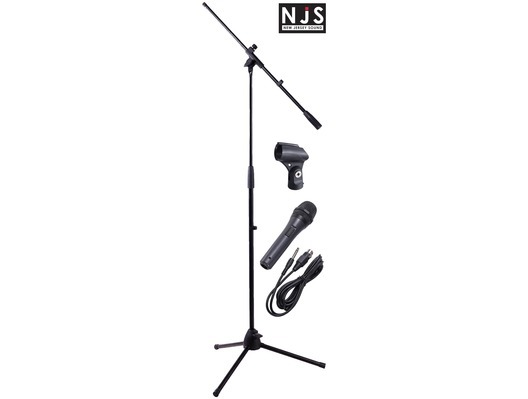 This handy kit comes with everything you could need, from the professional quality microphone, to the heavy-duty stand, right the way down to the connector cable making this the NJS Professional Complete Microphone & Stand Kit the perfect introduction into the world of live performance. Complete microphone kit, ideal for professionals or beginners. The kit includes a high quality microphone with on/off switch and XLR connector, a heavy duty mic stand with adjustable boom arm and a maximum height of 1.7m, a 3m XLR to 6.35 Jack lead, and a flexible mic holder.